Through our clothing drop-off hubs located at over 800 locations nationally, we’ve helped more than 2 million Australian’s responsibly dispose of things they no longer need. Here’s a list of items we accept, and we kindly ask for them to be in clean and reusable conditions. We can only accept items that can fit inside our drop-off hubs. Anything left beside the hubs, even if you’re trying to do the right thing, is considered illegal dumping. It looks messy, poses a safety hazard to the public and attracts scavengers or animals that rummage through your valuable contributions and steal what should be going to people who need it most. Here’s a list of items we don’t accept, but check out our Recycling Directory for other places who’ll reuse and recycle them. You can also check with your local council to see what programs they offer to their residents. SCR Group’s toy collections being distributed in Asia, to kids who really need them. Some of what we collect goes to charities and op shops in Australia. About 5% of what is collected meets retail quality in Australia. The clothes and homewares that stay in Australia are mainly sold to provide a source of income for charities. The rest goes to our overseas partner for sorting and global distribution. What can’t be reused in Australia is sent to our Australian owned partner facility in Malaysia for sorting and global distribution. SCR Group has identified markets all over the globe where there is a demand for the items we no longer want or are resaleable in Australia. For example, there is a demand for single shoes in the Middle East. Whatever can’t be reused is either sent for recycling or converted into alternate fuels in a nearby cement kiln. 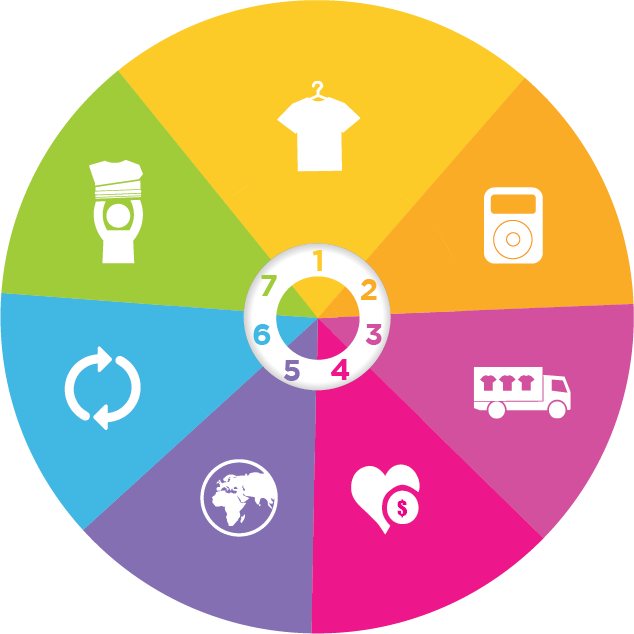 Reuse is the most environmentally friendly and socially beneficial avenue in the waste hierarchy as it uses the least amount of natural resources and supports a circular economy. We are able to reuse 70% of our total collections, recycling 15% and converting 15% into alternate fuels. As a result of our operations overseas, we are able to support 300 jobs in developing countries, helping growing economies and providing opportunities to communities living in less fortunate circumstances to earn sustainable incomes. Our partner facility provides safe and ethical working conditions and facilities, such as prayer rooms. People in countries as diverse as Eastern Europe and Asia get the things they need. What is reusable goes to countries where low-cost clothing is in demand, enabling accessibility to essential everyday items for global communities who need them the most. Employees at our Australian owned partner facility in Malaysia. You can search here for one of our 1,200 hubs across Australia. And we are growing! So if we don’t have a drop-off hub near you yet, please check back soon.